January 2011 issue on sale today! | What Hi-Fi? January 2011 issue on sale today! If you're looking for the ultimate system to make the most of your music, look no further. We've put together eight systems, ranging in price from £870 to £6275, from the likes of Cyrus, Linn, Naim, Roksan, Rotel, Yamaha and Rega. It's a hi-fi lover's dream. Each system includes speakers, amplification and source, and whether you're after a budget turntable set-up or state-of-the-art CD playback, we've got the system for you. If you have a hi-fi system already, then check out our bumper First Tests section for your next upgrade: this month, our team of in-house experts has been testing Leema's Pulse III amplifier, KEF's exciting new Q300 standmount speakers, Dynaudio's DM 3/7 floorstanding speakers and Beyerdynamic's stupendous T50P headphones. Not everyone necessarily wants a full hi-fi rig, so for those who store their music on an iPhone or iPod we've got a roundup of six low-cost iPod docks, from £100-£150. And radio buffs can peruse our test of the most stylish portable DAB radios from £40 upwards. Some of them would make an ideal Christmas present. Of course, we haven't forgotten our home cinema fans. For those who don't have the space for a massive TV, we've got a Supertest of eight high-tech 32in tellies, from £400-£800. They're the perfect compromise: big enough for high definition, small enough to fit at home. And if you need a new Blu-ray player to make the most of your new HD TV, our five-way Group Test of affordable Blu-ray players (£185-£295) is essential reading. We've tested models from Panasonic, Philips, Sharp, Sony and Toshiba. Meanwhile Chris, our Savvy Shopper from Bury St Edmunds, goes in search of a new Blu-ray player to replace his Denon DVD-1940 and much-loved Sony SACD player. Will the Cambridge Audio BD650 fit the bill? Plus three readers answer the question: "Is it worth paying more than £150 for a Sony Blu-ray player?" in The Big Question. Our Ultimate System Builder centres around the Sony PS3, an excellent media hub and worthy of top-notch partnering kit. Whether you want 3D gaming thrills, music streaming or on-demand movies, there's a system to suit. And if you want to pimp up your Apple iPhone 4, we've chosen a range of accessories to make the most of your smartphone. Home cinema First Tests include a lengthy look at Philips's ground-breaking Cinema 21:9 Platinum super-widescreen TV (aka the 58PFL9955H), a giant Sharp 60in LC-60LE925E 3D TV and an almost-as-large 55in 3D TV from Sony, the KDL-55NX813. On the sound front, the powerhouse that is Onkyo's TX-NR5008 multichannel receiver gets a full workout, along with the Yamaha RX-V2067 AV receiver, Jamo's slim D500 THX Select2 surround speaker package and Cambridge Audio's Minx S325 miniature 5.1 set-up. We've also spent a considerable amount of time living with Arcam's AVR600, which has been running in one of our reference systems for some months. We report back on just how well it performed over the long term. For those with deep pockets, or a recent lottery win, our Temptations section is bursting with fabulous kit: B&W's 805 Diamond speakers, Runco's LightStyle LS-5 DLP projector, Audio Analogue's Maestro Special Edition CD player and the SP Acoustics SP1 Signature speakers. At the other end of the size and price scale, we take a detailed look at the Galaxy Tab, Samsung's iPad rival, and Philips's GoGear Muse media player. 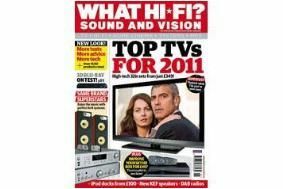 All this and more is packed into the January 2011 issue of What Hi-Fi? Sound and Vision, on sale now. And don't forget you could win a fabulous Philips 3D TV and matching Blu-ray player worth £2500 in our competition.